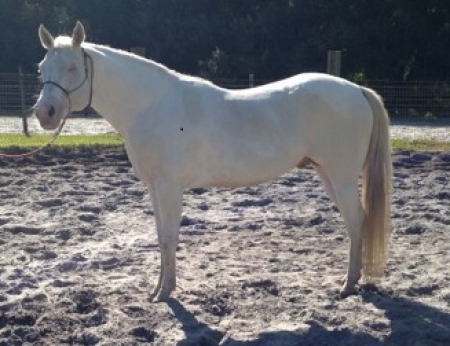 Jess is homozygous for both the tobiano and creme gene, as well as the agouti gene - all his foals will have base coat colors of either palomino and white, buckskin and white, or double dilute and white. I tried for years to produce this combination of genetics but am no longer breeding. He has been test bred and has produced as expected. He was started under saddle but since we had other horses to ride, has just been sitting and with his unique genetics we feel it is a shame for him not to be used for breeding. We want a GREAT home for him and are willing to work with someone that can offer that and will consider trades of equal value. 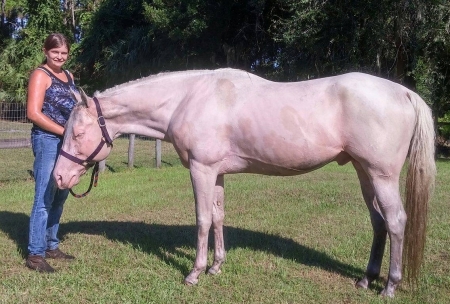 It is extremely difficult to find a horse this rare and we would like him to go to someone that can appreciate him and put him to use in their breeding program.